Eris Weaver, Mistress of this Website, is a Facilitator & Group Process Consultant in Northern California and adjunct faculty member at Santa Rosa Junior College. She received her MLIS from the University of California at Berkeley -- as part of the very last class before the program was shut down and reopened WITHOUT the "L" word in it! Previous employers include the University of California at San Francisco, Sonoma County Library, and the Redwood Health Library. She is currently President of the San Francisco Bay chapter of the Special Libraries Association, and has even performed at a Chapter meeting! Eris studied and performed modern dance for twelve years before being bit by the Middle Eastern dance bug. She loves the vast community of shimmying sisters she has met since then! She is dedicated to living on the edge, stirring up sh*t, and laughing. Loudly. Amber Ray recently got her MLIS degree from San Jose University and got her first job offer as Children's Librarian at Westminister Library. She's been involved with the Orange County CA dance troupe Tribe Roman Morga for about three years. Her costume is a particular point of pride as she made almost every stitch of it. Many parts such as the coin bra had to be hand-sewn, and other parts are heavily hand-embroidered. Rowan Fairgrove is a research librarian at a corporate R&D center in the San Francisco Bay Area. 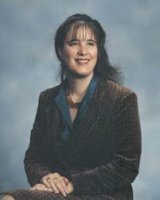 She specializes in scientific patent searching and other intellectual property research. Rohanna has been dancing off and on since the late 1960's and has had the pleasure of dancing with many fine women. She sees bellydancing a primal, magical women's mystery and feels connected to all the dancing women --mothers, daughters, grandmothers and maiden aunts -- who have gone before. Elizabeth Perry works at the Longview Municipal Library in Alberta, Canada. Ellysia started dancing over 20 years ago and currently teaches classes and workshops in Alberta, Saskatchewan, and British Columbia. At first she was viewed as somewhat of a pariah in this area, but is now viewed as "their" bellydancer. She have a float in at all the local parades and is dedicated to bringing an awareness of bellydancing as an art, into cow country. She says, "Most people around there thought we were strippers or something, but now they are coming to respect the dance as an art. 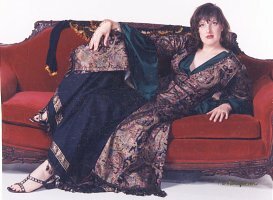 When I became the Librarian in Longview, I thought for sure that I was the only Bellydancing Librarian in the world. Thanks to your site I see that I am not alone! Keep up the good work ladies!" Ruth Kneale is the librarian for the Gemini North Observatory, in Hilo, Hawaii. 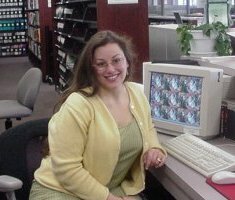 She received her MLIS in May '99 after working as Gemini's de facto librarian for four years, finding she liked it so much she wanted to make a career out of it! Check out her article "But You Don't LOOK Like a Librarian!" 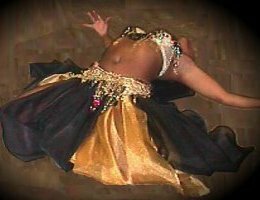 Najma began dancing in February 1997 on the suggestion of her doctor, for a low-impact aerobic exercise. She fell in love with it and has been dancing ever since! She studied at Dance of Arabia in Tucson Arizona until her recent relocation to Hilo, and is searching for a new studio and teacher. Amy Hale Janeke is a law librarian at the San Diego County Public Law Library. She received her law degree from Texas Tech University in Lubbock, TX, where she also began her belly dancing career. Two dancers from Jordan and Bahrain, foreign students getting their masters in agriculture and trade at Tech, were her first instructors in the art of belly dance. 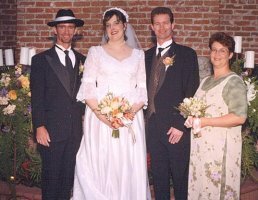 After law school, Amy went to the University of Tucson for her library degree where she met her best friend Ruth Kneale, also a belly dancing librarian and maid of honor at her wedding (see above). They danced with a troupe in Tucson and also as a duo called Chorea Bibliotecarta a.k.a.the Dancing Librarians. She moved to San Diego to be marry Erik, a high school biology teacher who wonders if her costumes are going to take over the entire house, and started working at the Law Library two years ago. Shirin now teaches both beginning and advanced classes in the east county of San Diego, and also dances at local restaurant and festival venues. Her librarian tendencies shine through in her class as she has prepared a 5 page annotated bibliography about middle eastern and dance related books! She also performs with a tribal troupe, half of whom are librarians. Aren Ginsberg has been a librarian since 1989, and began taking bellydance classes in 1992. She is now a middle school librarian in St. Louis. She says, "I often see current and former students when my troupe performs at local International Festivals. Several staff members have run across pictures of me dancing in the newspaper or on TV. What a shock! The school librarian isn't wearing sensible sweaters and modest dresses. All of a sudden she's covered in sequins and beads!" Michelle Cadoree is a science reference librarian at the Library of Congress in Washington, DC. She received her MLS from Louisiana State University in Baton Rouge in 1989 and has been with the Library of Congress ever since. Mansura, Michelle's alter ego, has been studying dance with Cha L Mar at Dancer Studio in Clinton, Md. for the past two years. Although she first took up belly dance for exercise, she admits that she stayed in for the costumes. Lauren Towler is Head of Circulation and Reserve at the Iowa City branch of the Kirkwood Community College Library in Iowa City, IA. She supervises a staff of 2 part-time and four student workers. She has held this position since she graduated from the University of Iowa in August 1998. Lauren has a B.A. with honors in Literature, Science and The Arts and plans to enter graduate school in Library Science in August 2000. She and her husband Kurt have been married for three years and enjoy riding motorcycles, cooking and star gazing. As Alzubra, she began her study of dance five years ago. During that time, she has danced with Kahraman Near East Dance Ensemble ('97-'98) and has studied under Marie Wilkes of Iowa City, Leila Gamal, Mona Na'wal, Suhaila Salimpour and Vashti of Dallas. Currently, she teaches dance at Scattergood Friends School in West Branch, Iowa and Kirkwood Community College Learning Center in Iowa City. Melissa Walsh is a children's librarian in New York state. As Mystique, she is a member of Sasha's Serpents of the Nile dance troupe. She is a newcomer to both the fields of librarianship and bellydancing, but enjoys both immensely. Melissa is also interested in fantasy, anima, the SCA and gaming. You can see some examples of her artwork on the Dark Elf Dungeons &em Dragons page. She has been known to wear her hair in a bun. Barbara Hoffman teaches Young Adult Sources and Services for C. W. Post College, has written a children's book series, does public relations work and, since the 1980s has been Head of the Young Adult/Audiovisual Services Department for Patchogue-Medford Library, the central research library in Patchogue, Long Island. She holds undergraduate degrees in Education and Music and a Masters in Library Science, certificates in computer technology from Columbia University and Gruman Data Institute, and has taken Communication courses at New York Tech, Public Relations courses at Hofstra University and Library Management courses at Stonybrook University. As Cleopatra, she was perhaps the first librarian to sing, play guitar and belly dance at Lake Placid for NYLA (not all at the same time, of course, although that would have been even more spectacular!) and belly dance for an ALA round table in Detroit. The November 1976 NYLA Conference Bulletin described Barbara as "The best automated system on display all week." She taught dance for many adult education districts in Nassau and Suffolk Counties, arts councils, and cable television stations. She toured through New York, New Jersey, Pennsylvania and Mexico with a group called The International Entertainers. Although she has hung up her zills, she still sings, writes songs, plays guitar and tells stories. One of her stories was published in Chicken Soup for the Grandparent's Soul. It's entitled "Gabriella and the Trophy" and is about her granddaughter's first dance recital. How's that for a bellydancing grandma! 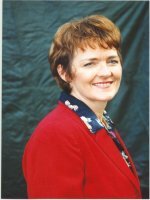 Maree Millard is currently employed as a librarian with North Point Technical and Further Education Institute in Queensland, Australia. Prior to this, she has worked in government and corporate special libraries ; ventured outside the traditional library fields into library systems software marketing, sales and support for 2 companies and also worked 9 months in a support and help desk role on a large library systems project with Fujitsu. Maree has a Website devoted to tips and hints on automated library systems. Maree took up the art of bellydancing just 12 months ago when by chance she met her bellydance teacher in a gym. Whilst still a beginner, Maree participates in as many displays and concerts as possible and plans on doing her first solo at the Christmas party 1999. 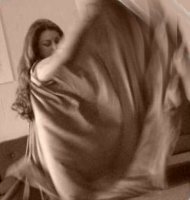 Throwing her heart and soul into the wonderful dance form, she also has taken up the tabla, playing with a local mid eastern drumming group, the Nomadic Soul Drummers, who regularly play at all sorts of gigs. Having a ball and planning on dancing and drumming into OLD OLD age! Mary Ann Cappa works for Los Angeles Public Library. Anaheed has been performing and teaching since the 1970's. She dances and teaches in the Los Angeles area, and directs the Perfumes of Araby Dance Company. Robin Wood is the Patron Services Librarian at the San Marcos (Texas) Public Library. She started at SMPL in 1985 as a part-time library clerk and received her MLIS in 1995. Her duties include reference services, fiction and periodicals selection, desktop publishing, and adult programming. She has instituted a very popular monthly music series featuring local musicians and is one of the major planners for the annual summer reading program. Robin (a.k.a. 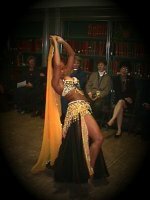 Aaminah) started bellydancing in 1996 after the birth of her daughter and has become a performing member of the Midnight Breeze Dance Company. They perform at many Central Texas festivals, participate in parades, and dance at area clubs and restaurants. One year we had a "Bedouin Banquet" where we prepared a Middle Eastern feast and belly danced between serving each courses. We are trying to raise the funds to purchase a PA system for our parade float. We also perform hula dancing and are looking forward to performing at the annual benefit Luau for our area women's shelter. We have a lot of fun and are currently trying to figure out how we can participate in the San Marcos River Parade on July 4th. Belly dancing on a floating barge is a challenge we just can't pass up! Susan Shiras is the Librarian at the Brooks Institute of Photography in Santa Barbara, California. For 13 years she worked as the Corporate Librarian for Santa Barbara Research Center, a subsidiary of Hughes Aircraft Company. She has also worked at the Santa Barbara Public Library, Santa Barbara City College Library, and the Reeves Medical Library at Cottage Hospital. For the last 21 years she has belly danced in Santa Barbara's Summer Solstice Parade. She says, "I do not do it for money, just for fun. I have 2 daughters now (a 5 year old and a 1 year old). The 5 year old and my mother have danced with me the last 2 years in the parade. There have been as many as 50 belly dancers and one year I was the only one. It is a really fun parade. I danced even when I was pregnant with both of my daughters." If YOU are a Bellydancing Librarian and would like to appear in this gallery, email me at erisw@sonic.net. Send me photos, stories, the URL of your Website, etc. and I will include them. (Photos must be in JPG format; or you can snailmail me a photo, which I will return after scanning.) I reserve the right to edit for size &/or length.